Within the business running, a number of organizations face a wide array of challenges. Yet, the constantly evolving world of eCommerce platforms provide the companies with a holistic selling strategy and productive performance. Although the strengths and effectiveness of the current solution, some business owners compare the existing shopping cart with other ones and move information to the more advanced platforms. Lately, Magento shopping cart draws a lot of attention with its robust functionality and vast customization opportunities. As a result, many companies perform Magento data migration to boost sales, enhance business processes and increase ROI. Let’s investigate the main platform’s capabilities and outline the core peculiarities of Magento migration to help you run the transfer swiftly and effortlessly. Magento’s marketplace includes an array of extensions that are already built into the core product. Concerning Magento pricing, you can select between the 2 subscriptions: Magento Community that is free to download, and Magento Enterprise. Regarding the online store building part, the first edition comes without development support, so remember to save a buck on buying your own host, domain name, etc. Now, when you have got acquainted with the essential solution’s peculiarities, what are the steps has to be taken to migrate to Magento smoothly? Among the set of recommendations, let’s highlight the most critical ones on how to prepare your e-store for the upcoming change. Outline your plan and set up the flexible schedule. Put the most complicated decisions upfront and address them in accordance with their importance. For example: a number of entities require cleansing, or Magento import products should take place. The data migration can’t go too far without the thorough analysis of the eCommerce items. After the records’ cleansing is behind, investigate how many entities should be switched. The process helps you identify the starting point for the data quality and reveal the potential issues. Since eCommerce entities are the core of your future database, make sure to exclude any possible information loss. In this case, it is recommended to create a backup of your e-shop and keep it even after the transfer is over. Magento includes the limitations on creating a couple of customers with the same email. So, when you are importing to Magento, you get only one customer with a particular email on your future solution together with all orders. The price on your current platform and Magento may differ due to the Magento settings. In this case, Magento lets you adjust the price and tax in accordance with your business requirements. Magento offers the fixed attributes sets. In this case, every number of attributes can get its unique attribute set. Get more information here. Concerning the Magento functionality, some products are transferring to the simple products. However, if your product includes a variant, it will move to the configurable product automatically. Magento provides you an ability to create the multilanguages through the storeview. Every storeview can have its own appropriate language. Let more information on how to add the new language in Magento here. Magento has certain prefixes for the order IDs that are based on the e-store IDs. Check out our FAQ and learn the useful insights. Register Cart2Cart account or log in via your social networks. Provide your current platform’s credentials like URL, API Path, etc. Select Magento as your future platform and fill out its URL. Then, tick the entities you want importing to the desired solution, as well as choose other options to improve the data transfer opportunities. Also, map the fields and run Demo Migration if needed. Now, if you are satisfied with test results and ready to perform the Full Migration, launch Magento data migration. Perform a test purchase to explore if everything runs in the right way. You can try to perform the process a few times to be safe. 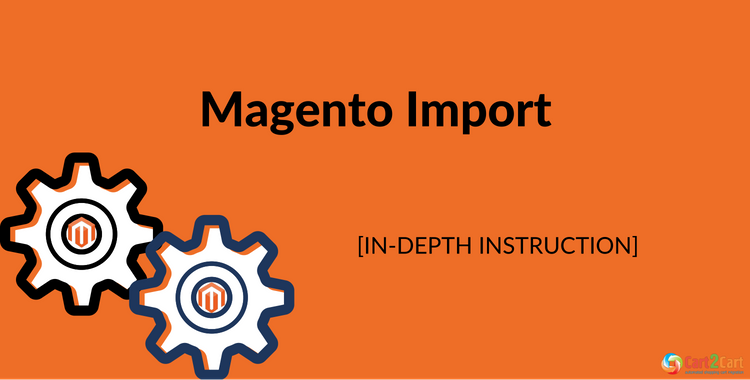 Learn more information on how to manage the online shop after Magento import here. The decision of migrating to a new shopping cart is critical that requires time and efforts for preparing your business and budget. Thus, it is important to create a workable plan for Magento import and set up the clear future organization’s goals. The successful Magento data migration can lead to the advantages related to the e-store process optimization and revenue growth.